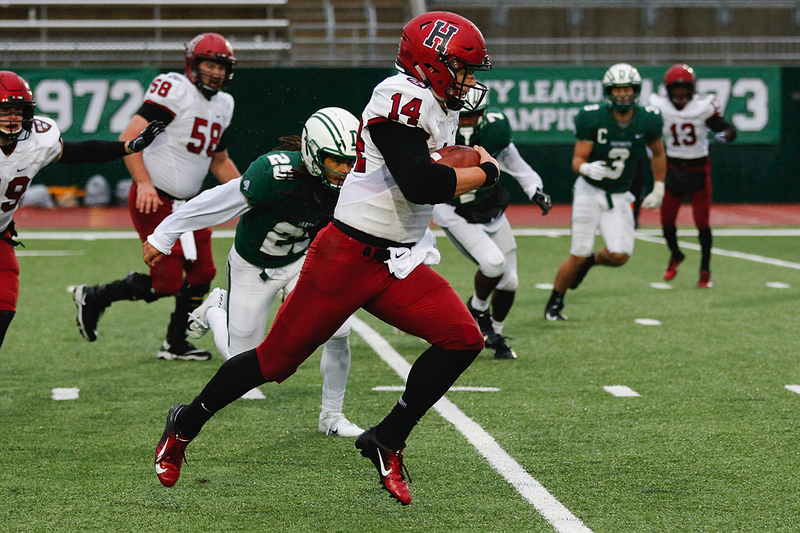 Having snagged a toss from quarterback Tom Stewart, Harvard's Tyler Adams sets sail past Dartmouth's DeWayne Terry Jr. (7) and Andrew Lemkuil. The emerging Crimson sophomore made two key catches on Harvard's third-quarter touchdown drive. Next stop, paydirt: Harvard's Tom Stewart rumbles past Dartmouth defensive back Isiah Swann on his way to a fourth-quarter touchdown. The Crimson's senior quarterback rushed for a team-high 76 yards. The victory was Dartmouth’s first over Harvard since 2003, and the first for the Big Green over the Crimson at Memorial Field since 1993. It also was the first time that Dartmouth coach Buddy Teevens, whose second stint as Big Green coach began in 2005, bested his boyhood pal and lifelong friend, Crimson coach Tim Murphy, who has been on Harvard’s sideline since 1994. For the first time ever, Harvard has played three ranked teams in a season: Rhode Island, which entered its 23-16 victory on September 28 over the Crimson ranked number 20 in The Football Championship Subdivision; Princeton (FCS number 18); and now Dartmouth (20). 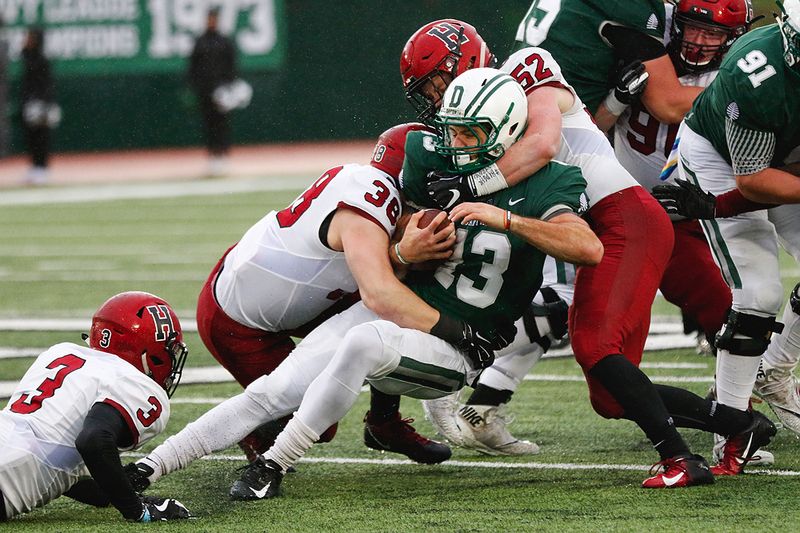 In all three losses, Harvard was, as the expression goes, a “tough out.” On Saturday, a rainy, chilly afternoon during which the ball was slick, the Crimson could not survive four first-half fumbles forced by the alert, hard-hitting Big Green defense. On both sides of the ball, Dartmouth's strategy was devastatingly simple. 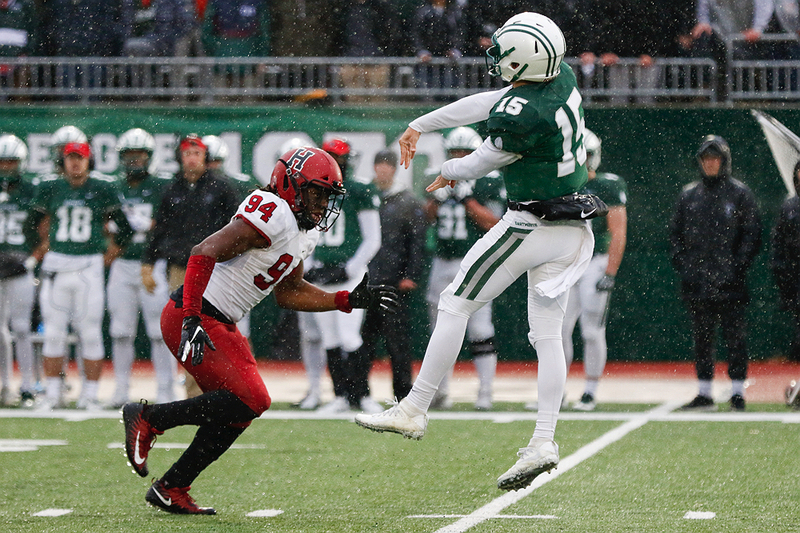 Offensively the Big Green kept the ball on the ground, with Dartmouth quarterback Jared Gerbino often calling his own number. Gerbino ran 24 times for a game-high 183 yards and a touchdown. The interior of the Big Green offensive line is manned by the Kilcommons twins, each at 280 pounds a broth of a lad: center Patrick and guard John. They are a load. On defense Dartmouth keyed on Harvard running back Aaron Shampklin, and it worked: the sophomore star, who entered the game averaging 129.7 yards on the ground, was held to 46 on 16 carries. In essence, the Big Green dared Crimson quarterback Tom Stewart to beat them—and though he didn’t achieve that aim, Stewart gave a very, very good account of himself. In his third start of the season the senior from Dallas showed surprisingly frisky legs, running for a team-high 76 yards (including a 22-yard touchdown scamper). He also completed 24 of 42 passes for 270 yards with no interceptions and kept the offense on the move, so much so that Harvard won the time of possession battle, 31:45 to 28:15. Some of that, though, was due to Dartmouth’s quick scores. The Big Green got the jump on its second play from scrimmage when halfback Rashaad Cooper ran off tackle to the left through a large hole and streaked 82 yards to the end zone. Connor Davis kicked the extra point. Dartmouth 7, Harvard 0. Later in the first period came a play that symbolized the Crimson’s first-half frustrations. Harvard drove from its own 24 to the Dartmouth 44 and appeared to have some momentum. On third-and-eight, Stewart handed to senior back Charlie Booker III. Booker was hit by defensive end Niko Lalos and coughed up the ball. Big Green defensive back DeWayne Terry Jr. scooped it up and ran it back 62 yards for a score. Davis again converted. Dartmouth 14, Harvard 0, with 4:12 remaining in the first quarter. A rout seemed entirely possible. The Crimson mounted a comeback. 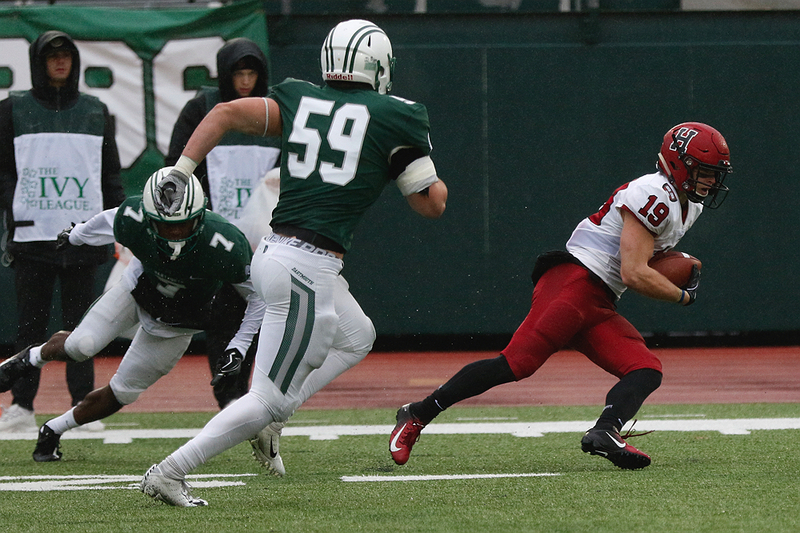 Stewart led Harvard on an 11-play, 60-yard drive that reached the Big Green 13. There, on second-and-three, he threw a swing pass to B.J. Watson. The sophomore back got as far as the eight-yard line, where he took a rattling hit by Dartmouth defensive back Bun Straton that jarred the ball loose. Big Green linebacker Jack Traynor recovered. Drive blunted. On Harvard’s next possession Traynor forced Shampklin to fumble, and Dartmouth defensive back Isiah Swann recovered. The Harvard defense got the ball back, and the offense tried again. An 11-play, 57-yard drive ended on the Dartmouth 26 when Stewart failed to connect with sophomore tight end Ryan Reagan on a fourth-down pass. Clearly Gerbino had seen enough. On the ensuing possession he rushed the ball six times; on the final run, he knifed off left tackle and scampered 20 yards into the end zone. Davis kicked the extra point. Dartmouth 21, Harvard 0. At the half Harvard had 13 first downs to Dartmouth’s seven and led in time of possession 17:56 to 12:04. Nevertheless, the only real question seemed to be how large the Big Green’s margin would be. Like most successful coaches, though, Murphy teaches his teams resolve, and that is what the Crimson displayed at the beginning of the second half. This time a long drive paid off in a seven-yard touchdown run up the middle by Shampklin; the score had been set up by two Stewart completions to Harvard’s newest offensive weapon, sophomore wideout Tyler Adams. Junior Jake McIntyre kicked the extra point out of a good hold by Stewart. Dartmouth 21, Harvard 7. And no matter what else would happen on this dank day, the Crimson had extended its Ivy-record streak of not having been shut out, which now stands at 205 games dating back to the 1998 season opener against Columbia. On the next Big Green possession, Harvard dodged a bullet when Davis missed a 39-yard field-goal attempt wide left. But early in the fourth quarter Dartmouth got nearer to the goalposts and this time Davis nailed a 22-yarder. Dartmouth 24, Harvard 7. With a little less than 10 minutes remaining, Harvard would need three scores. The Crimson got two of them. Stewart accomplished the first on a 22-yard quarterback draw on which he wended his way from left to right into the end zone. McIntyre’s point after was good. Dartmouth 24, Harvard 14. On the next possession Harvard forced Dartmouth into a three-and-out. The Crimson took over at its 42. Three completions from Stewart to junior wideout Jack Cook helped move the ball to the Big Green 11. There the drive stalled, so McIntyre booted a 28-yard field goal. Dartmouth 24, Harvard 17. One minute and 38 seconds remained. For the second straight week, a miracle finish hinged on a successful onside kick. But freshman Jonah Lipel drilled the ball all the way out of bounds. Dartmouth took over and ran out the clock. For the third time against a tough foe, it was too little, too late. Coming up: Next Saturday Harvard returns to the Stadium to take on longtime Ivy rival Columbia. Kickoff: noon. The game will be telecast on NESN, streamed on ESPN+ and broadcast on the radio on WRCA 1330 AM, 106.1 FM and 94.5 FM-HD2, and on WHRB FM 95.3. The Lions are 4-3 overall and 1-3 in the Ivy League. The Crimson leads in the overall series 61-14-1; Harvard has won the last 14, including 21-14 last year in New York City.